Cite page (MLA): "Acknowledgments." In Livingstone's Final Manuscripts (1865-1873). Megan Ward and Adrian S. Wisnicki, dirs. Livingstone Online. Adrian S. Wisnicki and Megan Ward, dirs. University of Maryland Libraries, 2018. Web. http://livingstoneonline.org/uuid/node/c469b0b9-9cf5-485b-bbc5-329cb3665448. This page cites the individuals and institutions that have made a special contribution to supporting our work in developing the critical edition of Livingstone's final manuscripts (1865-73). 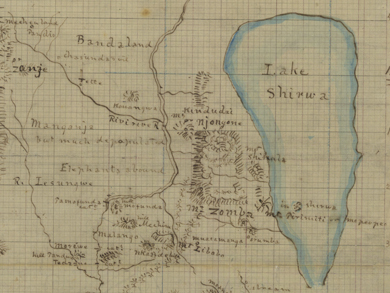 David Livingstone, Map of Central African Lakes, 1867-1872, detail. Copyright National Library of Scotland. Creative Commons Share-alike 2.5 UK: Scotland. Livingstone's maps typically combined observations he made first hand with data he collected from informants, often in an unacknowledged fashion. The production of the present critical edition required four years and the collective efforts of a project team numbering over twenty individuals. None of this work would have been possible without the support of the National Endowment for the Humanities (NEH), one of the greatest cultural funding organizations in the United States. The project team is grateful to the NEH and its officers for making this edition possible and, most importantly, for infusing our project with a positive and vibrant spirit that carried the project through every stage, however difficult. The project team would also like to acknowledge the considerable direct-cost contribution that the University of Nebraska-Lincoln (UNL) made to the development of our edition. Beyond this contribution, the staff of the UNL's English Department, Office for Research and Economic Development (ORED), Love Library, and the Center for Digital Research in the Humanities (CDRH) provided extensive administrative support that allowed for the smooth functioning of the project from end to end. Finally, the project directors would like to thank our team of encoders (listed by name on our project team page). The encoding of over 2200 manuscript pages required endurance, perseverance, and unflagging goodwill. Our encoders manifested these qualities in abundance and became the bedrock for all our accomplishments.